Lock in a great price for ANA InterContinental Manza Beach Resort – rated 8.5 by recent guests! The property was very clean and comfortable. Location is superb. The beach, view, and property itself was excellent. Everything was perfect. The location, staff members, facilities, beach activities and check-in/out process. It is very family-friendly. The staff is very helpful and nice. The cleanliness, the friendliness and the convenient. Staff very kindness and helpful. Excellent view. Breakfast and dinner is very good. Loved their facilities, staff was amazing and it was a very fun stay. Isolated and the area was naturally very beautiful. beautiful sea view and garden from the room, good breakfast, friendly staff , excellent parking and excellent public bath and sauna . enjoy every morning walk around the neighborhood. I don't know the alternatives but this place through on the upsell. Very large and I'm personal and not that accommodating. Very hard to get to from the airport. No shuttle. Made a big deal about getting mango. Staffs are very nice and informative. All of them speaks decent english- or at least communicational. Beach activities are very good and also staffs at beach houses were awesome. We had really bad weather- typoon- so lots of activities were canceled and not available to use. They did not have much to do inside the hotel but if the weather was nice, I think this place would be very nice with kids. Very kids friendly- bath was nice touch- different restaurant option was good too. ANA InterContinental Manza Beach Resort This rating is a reflection of how the property compares to the industry standard when it comes to price, facilities and services available. It's based on a self-evaluation by the property. Use this rating to help choose your stay! One of our top picks in Onna.Surrounded by the ocean, ANA InterContinental Manza Beach Resort features an outdoor pool, spa and tennis court. Free WiFi is available throughout the property. The Club InterContinental Lounge offers ocean views from floor-to-ceiling windows. All rooms feature air conditioning, a balcony, flat-screen TV and safe. A mini-bar and tea/coffee making facilities are provided. The private bathrooms feature a bath, shower, hairdryer and free toiletries including toothbrushes, shampoo and conditioner are also provided. The ANA InterContinental Manza Beach Resort offers water activities including snorkeling, diving and hiking. The resort houses a mini-golf course and shops. Rental bicycles, canoes and jet skis are available. Guests can also use the on-site fitness center, hot tub and sauna. The resort features 6 restaurants and 2 bar lounges, ranging from Italian to Japanese cuisine. Restaurant Aqua Belle serves international dishes, offering a la carte meals and buffets. Restaurant Unkai offers traditional Japanese cuisine and local Okinawan dishes. 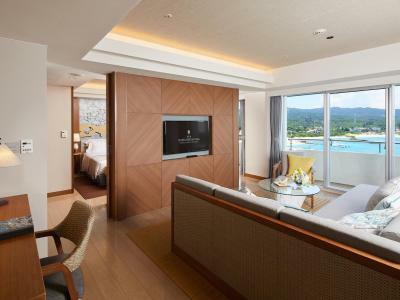 The ANA InterContinental Manza Beach Resort is a 45-minute drive to Shuri Castle. Churaumi Aquarium and Naha Airport are an hour’s drive away. Direct airport limousine buses are available to/from the hotel at an extra fee. When would you like to stay at ANA InterContinental Manza Beach Resort? Located on floors 5-7. This ocean view air-conditioned twin room features a balcony, 42-inch flat-screen TV, safe, mini-bar and electric kettle. The property will allocate a room type to the guest on arrival. Located on floors 3-4. This twin air-conditioned room features bright and clean decorations and a balcony. A 42-inch flat-screen TV, safe, mini-bar and electric kettle are provided. This room is located on the 5-7th floor. This ocean view air-conditioned twin room features bright and clean decorations and a balcony. A 42-inch flat-screen TV, safe, mini-bar and electric kettle are provided. This sea view twin room is located on the 8-9 floor. Features access to the club lounge including a complimentary breakfast, afternoon tea and evening cocktail with a side dish. This twin room is located on the 5-7th floor. This bright and cleanly decorated air-conditioned room features ocean views and a balcony. A 42-inch flat-screen TV, safe, mini-bar and electric kettle are provided. Located on floors 3-4. This bright and clean air-conditioned twin room overlooks the beach and features a balcony. A 42-inch flat-screen TV, safe, mini-bar and electric kettle are provided. This twin room features access to the club lounge including a complimentary breakfast, afternoon tea and evening cocktail with a side dish. This sea view twin room with bright and clean decoration is located on the 5-9 floor. This sea view suite room is located on the 6-7 floor. Rooms feature a spacious terrace and living room. ANA InterContinental Manza Beach Resort is proud of its well-established reputation gained during the long history in Okinawa. This Manza Beach resort is located in the middle of Okinawa's main island, with easy access to the north and south area. 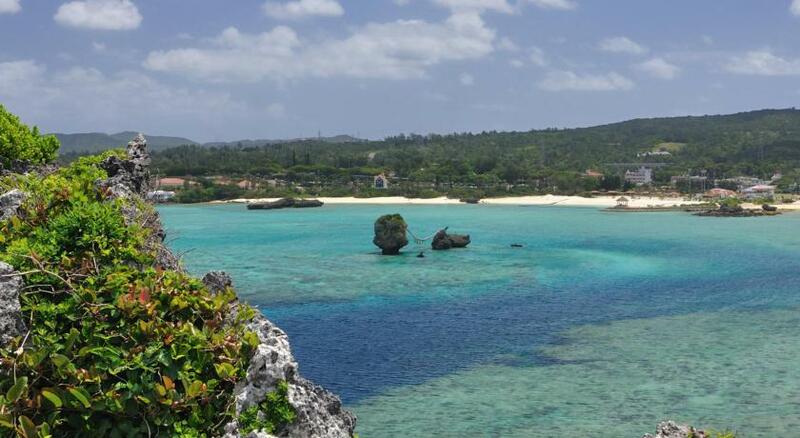 The hotel is near Cape Manzamo, one of the top tourist spots in Okinawa Island, and around this Okinawa resort are many places of interest and tourist attractions such as Shuri Castle, the vibrant Nakayukui Market and the Onna Village Museum. House Rules ANA InterContinental Manza Beach Resort takes special requests – add in the next step! ANA InterContinental Manza Beach Resort accepts these cards and reserves the right to temporarily hold an amount prior to arrival. Children can stay free of charge only when extra beds are not required. Please notify the property in advance if guests plan to bring children who will sleep on existing beds. Please note, due to natural disasters affect on water conditions and safety conditions, the property's on-site water activities are temporary unavailable. Stayed in ANA Manza beach resort from 4/15-18, love the cozy environment, helpful service and all staff were friendly and with fluency English , especially front desk Ms Lily Liao, thank you for finding my missing bag and getting refund from hotel convenience store. 3 days in Manza beach IHG, the view from room was amazing, able to see the Manza cape, and my little boy felt fun with the stamp collection, and that was good to know the surrounding of resort. Highly recommended the resort to family , will definitely come back in summer time! Every staff is very good. I am just not used to a small strip of private beach since I travel often to Lombok and have my own beach front villa. So thats a disappointment. Also that the hotel diving and snorkelling are all fully booked, and expensive. The diving shop they recommended are also fully booked. , The Orchid restaurant with the Okinawa performance is quite a disappointment both in terms of food/buffet spread and the performance. In terms of room amenities, it is quite annoying to not have a bathrobe available.I do expect a hotel of this class to provide this basic stuff. There is SPA (I think this is separately run and not by the hotel, the foot massage is disappointing. Not staying here in future simply because there are others to experience as well. We actually extended one more day at ANA. The staff here are really nice, goes all the way out to help me locate a room with a view away from the construction across the beach as I only want an unblock ocean view. I was unwell on day 2, and they arrange a taxi to bring me to pharmacy, the nice touch was that the staff already called them in advance to pre informed them of the medicine I need for cough and cold. The hotel is well kept despite 35 years already. Room is comfortable, though a bit small but for most people this size is considered good. Last but not least the Japanese restaurant was very kind to give us the lunch for free since we missed our breakfast. There is a shuttle to bring you to the gate area so you can drop off there to walk to town, this is quite important as the hotel ground is quite huge. The hotel is in need of refurbishment. The rooms are tired and the decor is very dated. Certainly not 5 or even 4 star standard - but charged at that price point. A lot of the facilities are charged in addition to the room rate (beach floats, kayaks etc). Nowhere to refill water bottles. The staff are friendly and helpful, the beach and surroundings are lovely, and everything is clean and tidy. Breakfast was good, as was the Italian restaurant. Cot provided for my son, and high chairs available at all restaurants. Breakfast is good with a lot of options. Japanese and Continental. Food is fresh and well presented. Staff is so attentive. Exceptional customer service. A lot of activities to do in the resort. As Japan standard, it’s considered 3 star for cleanliness. Air conditioning not working as requested. Took too long for check in. Breakfast. Interior coordination colour tone. The hotel staff is very friendly and provides us all the necessary assistance. it make our stay like a VIP. It is a place that can not do anything unless it is summer. The bed was good, but the caustic rain is not good. Great experience to stay. Owesome seaside view from the room. Super clean and beatiful beach and landscape. The staff at reservation counter (for booking kid's play land, scuba diving...) is cold, and arrogant, totally a minus to the great service provided by the receptionists. Another thing I don't like to their messages, poor skill, poor aroma...poor mood in non-private environment (6 beds in the same open area, and other ppl who use public bathroom walked by when I was taking message. Will never use it again. Love the hotel, especially the reception staff (I have opposite feeling about reservation counter) - they provide different language staff to support worldwide tourists' needs! The staff is proactively helpful, friendly, and energetic! Also, 2 different style of breakfast to choose, western and pure Japanese. Not a fan for Japanese, but really love the Western one (Aqua Belle), vivid choices and the flavor is good. They do not provide self-service coffee machine, but you can tell any staff to bring you one, and that tastes much better!!! The beach is in 10 minutes walking and the view is breath-taking! I will book this hotel again when visiting Okinawa next time - avoid those 2 things I did not enjoy.